(Nanowerk News) The newly developed STED-RICS microscopy method records rapid movements of molecules in live samples. By combining raster image correlation spectroscopy (RICS) with STED fluorescence microscopy, researchers of Karlsruhe Institute of Technology (KIT) opened up new applications in medical research, e.g. analyzing the dynamics of cell membranes at high protein concentrations. This method is now presented in Nature Communications ("Stimulated emission depletion-based raster image correlation spectroscopy reveals biomolecular dynamics in live cells"). How do individual biomolecules move in live cells, tissues, or organisms? How do the biomolecules interact? These questions have to be answered to better understand the processes of life on the molecular level. STED fluorescence microscopy allows to pursue the movements and interactions of biomolecules in live samples with high spatial and temporal resolution. For this purpose, the structures to be studied are marked selectively using fluorescent dyes. Then, changes with time can be videotaped. However, the image sequence is rather slow, such that rapid molecule movements cannot be recorded directly. A group of KIT researchers around Professor Gerd Ulrich Nienhaus from the Institute of Applied Physics (APH) and the Center for Functional Nanostructures (CFN) now presents a new method to measure such rapid molecule movements in live samples in the Nature Communications journal. The new method combines two types of microscopy. Using a confocal scanning microscope, fluorescence images are recorded point by point at fixed time intervals. Hence, the images contain an implicit time structure. This information can be used with the help of raster image correlation spectroscopy (RICS) to determine the dynamics of biomolecules, such as proteins, in live cells or tissue samples. However, protein concentrations often are too high to apply RICS together with conventional microscopy. For this reason, the KIT researchers combined the RICS method with STED microscopy (stimulated emission depletion microscopy). When using STED, the light spot scanning the fluorescence image can be reduced considerably. This method has already been used successfully to reach a maximum resolution in the imaging of cells. A STED microscope is a fluorescence microscope, whose resolution is not limited by the Abbe limit. By combining raster image correlation spectroscopy with STED microscopy, KIT researchers have now succeeded in quantifying molecule dynamics in biological structures based on the raster images recorded. “This means that the STED-RICS method can be used to derive from any fluorescence image a highly resolved map of the number and movability of the marked molecules in the area scanned by the spot,” Gerd Ulrich Nienhaus explains. Professor Nienhaus’ working group consists of physicists, chemists, and biologists. Interdisciplinary cooperation is indispensable to cover all aspects when developing new microscopic instruments and methods for biophysical fundamental research. When applications are addressed, other KIT researchers join the team and contribute their knowledge of molecular processes. In the case of the STED-RICS method, the team worked together with scientists from the Institute of Toxicology and Genetics (ITG) and the Cell and Developmental Biology Division of the Zoological Institute. The STED-RICS method opens up new measurement applications in life sciences. 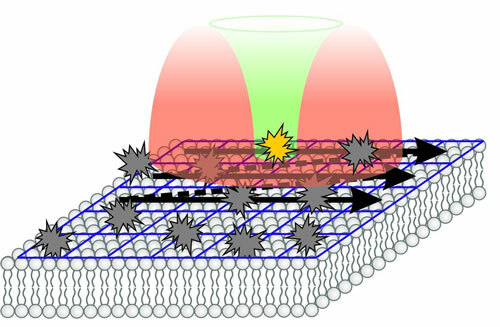 A major application is research into the dynamics of cell membranes. Numerous receptor proteins are embedded in the membranes. By interaction with externally docking ligand molecules, external signals are transmitted into the cell. With the help of STED-RICS, the researchers can now determine precisely and quantitatively the movements of both lipids and receptors. Understanding of these processes is of crucial importance to medical and pharmaceutical research. Many pharmaceutical substances are based on influencing these interactions. “About every second medical substance influences signal transduction of G-protein coupled receptors, an important sub-class,” Professor Nienhaus explains.